This is the second in a series of posts about performance storytellers who are long time bloggers. It is in response to a Liebster award nomination from Nillu Nasser Stelter. Since the reciprocity part of the award – in which you nominate others and ask them questions in turn – is interpreted in various ways by various people, I decided to take some flexibility with the rules. All of the bloggers I chose are professional storytellers, and for many of them their repertoire includes folk and fairy tales. They perform and teach storytelling in schools, for congregations, at festivals, for corporations. For most of them, slam storytelling is either not part of their repertoire or a very recent addition. So their blogs will give readers a much broader appreciation of performance storytelling than my weekly posts have to date. Priscilla Howe is the first to respond to the questions I posed, choosing the ones which were of most interest to her. 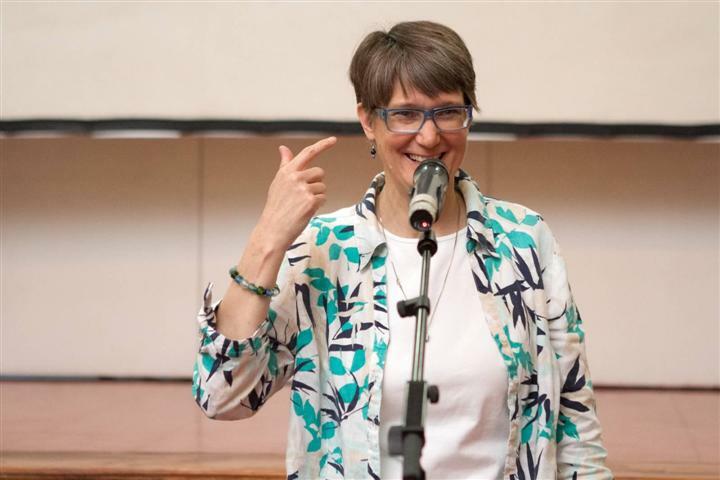 You can read the full set of questions (and see the list of storytellers I asked to respond to them) in the first installment of Storytellers Who Blog, which profiles Ellouise Schoettler. Priscilla Howe has been telling stories since 1988, when she was a children’s librarian in Middletown, Connecticut. (Not surprisingly, many professional storytellers I know started out as librarians.) She began telling stories in preschool story hours and school visits. Priscilla hadn’t intended to be a puppeteer, but one short lesson got her hooked on puppets. Now she keeps company with over 75 of them. Priscilla became a full time professional storyteller in 1993. About that time she also moved to Kansas. (No apparent Oz connection.) She carries around 150 stories in her head at all times, ready to tell. Storytelling is her only job. She has travelled around the country and abroad (Brazil, Germany, Bulgaria, Mexico, Peru, Argentina, Chile and Belgium, to date), giving 200+ performances a year at schools, festivals, libraries, Juvenile Detention centers and special events. One of her specialties is performing for English language learners. This summer, Priscilla will be going to a Fulbright Institute in Bulgaria, and in 2015, she has a full Fulbright research fellowship to collect stories there. Priscilla’s newest program is “Shakespeare’s Inspiration,” a program for older kids and adults in which she tells the stories that inspired Shakespeare to write King Lear, Taming of the Shrew and Hamlet. Her CDs and DVDs have received critical acclaim and have accompanied many families on long car rides. She lives in a beautiful old neighborhood in Kansas City, KS with her cat, Francis Bacon (Sir) and all those puppets. You can find out more about her on her website, which also houses her blog. She tweets @priscillahowe and is also on Facebook. Priscilla has been consistently blogging longer than any other storyteller I know – since December 2004. (You know, back when the Internet ran off an opaque projector.) In her post, she talks about why she blogs, the audiences for her blog and for her performances, and where the overlap is; what happens to her brain when I ask about page views and visitor counts; and about some of her favorite posts. 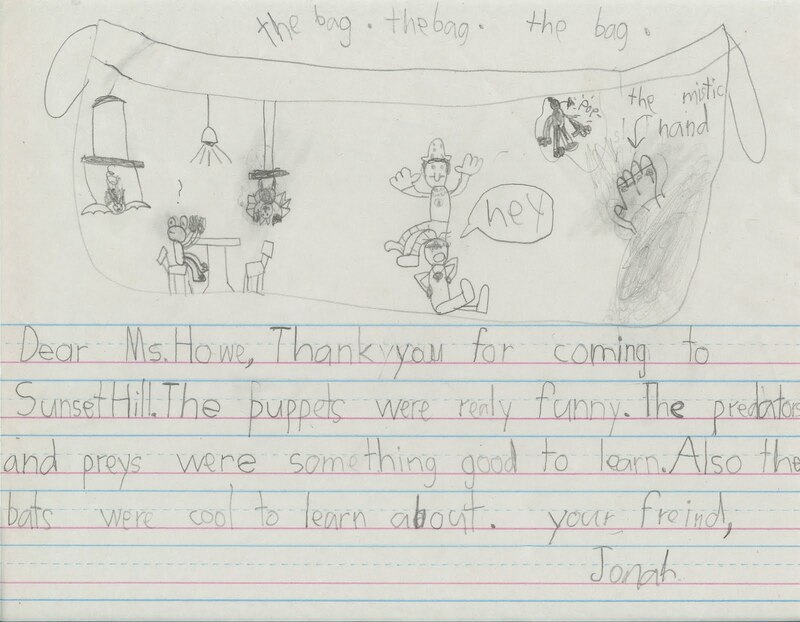 I particular enjoyed checking out the post about what really happens in the puppet bag, based on a picture a seven-year old drew for her. If you are a very lucky storyteller, someone might write you a note like this one. In addition to the other posts she cites, the local storytelling organization I’m a member of, Story Arts of Minnesota has used her post on how to book a storyteller as a guide for people without a clue where to begin. Recently she also published a post on the National Storytelling Network blog, Bringing Old Tales to Light. You can read her answers to my questions here in full. Next week, I will be going into hyperblogger mode. Taylor Tower, also a SAM board member, a storyteller who earned her chops at Montreal’s Confabulation and has taught at the Loft Literary Center. The week before mine (but not yet published) belongs to slam poet Neil Hilborn, whose YouTube performance of a poem called OCD at Rustbelt 2013 went viral on Reddit and appeared in the Huffington Post and on Upworthy. If you haven’t seen it, you should. So yeah. I’ll have some writing to do. Thanks for the award and the great write-up, Paula! You’re very welcome, Priscilla! Thank you for taking the time to answer the questions. Thank you for always broadening the boundaries of the story-telling world. It’s encouraging to see so many story-tellers from so many walks of life and how many opportunities there are to share stories through performance. And here I thought you had to be a marketer or a writer! :-) Good luck with your hyperblogging, and congratulations on your well-deserved award recognition for blogging! Well you don’t see me trying to become a professional storyteller… but I certainly admire those who take that risk, and are able to put so much time and attention into their craft. Yes, Congrats, Paula, on your award, and what a great way to introduce the story telling community. I’m in awe – not just of your courage to stand up and tell stories in front of audiences – but of the amount of writing you do as well! Long may you keep it up! Yes, and some day I may even get to my writing process blog hop post (sigh). Just so you know it’s not been forgotten.